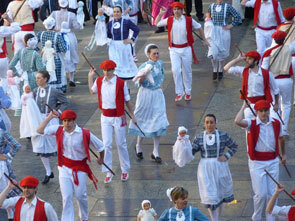 A few days before carnival, the 'Caldereros' commemorate the arrival of Hungarian tinkers to San Sebastian. The most significant characters of the parade are the Queen, the Ladies, the Director and his assistants, the bear, the bear cub and its tamer. Artzaiak (shepherds) and Iñudeak (nursemaid) Day is celebrated a few days before Carnival. On this day, men and women re-enact the courtship between the nursemaids and shepherds when they came down town from the mountains to the city. 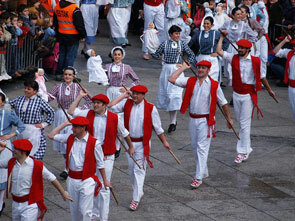 Carnival is an especially important event in Tolosa and San Sebastian. During these days, 27 parades go out to brighten the streets of the provincial capital of Gipuzkoa, filling them up with colour and humour and participating in a competition in order to win the Great Carnival Award and the Great Humour Award.